There are two new shows at Walibi Schtroumpf this season. First up, Extreme Divers. It is an open air show of acrobatic diving, the highlight being an impressive dive from a height of 28 meters into a pool with a depth of at least 3 meters. 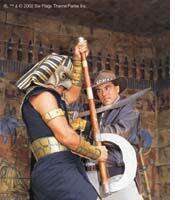 Pharaoh's Treasure puts a highly charged Indiana Jones against an evil priest of Râ, the Egyptian sun god.The intrepid archeologist has to surmount the evil cunnings of the priest. With many laughs, special effects, and well-choreographed fights it all lasts (including the pre-show) 25 minutes.